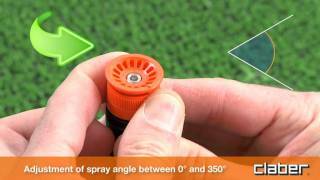 A professional quality pop-up sprinkler for underground irrigation systems in home gardens. The nozzle has a special design that guarantees the utmost uniformity in irrigation over a circular area with minimum water consumption. Equipped with a jet range adjustment screw with a hexagonal insert, return spring in resistant, waterproof stainless steel, high filtering power filter, self-lubricating gear and no-runoff rubber valve with antifreeze device. The choice of materials and quality of the production process are the guarantee of total reliability in any type of installation. The nozzle has a specially designed profile to ensure uniform and balanced water distribution. Stainless steel jet range adjustment screw. The standard 1/2” female connector allows it to be mounted on existing systems. Height from ground 2” (5 cm). Comes in pack of 30 pcs.